Akoya’s Diane Allard used her knowledge of lighting gleaned through her Akoya work supporting the DOE Solid-State Lighting program to recommend long-lasting, energy-efficient LED lights during a recent community service project. Diane was part of a volunteer team that made repairs to an Arlington, VA, community home for adults with intellectual disabilities. The LED screw-ins used to replace the existing, unsafe bathroom light fixtures will provide better lighting for many years at a lower cost. 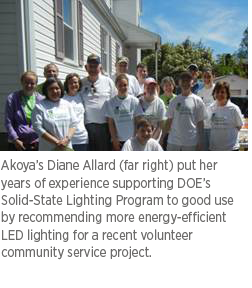 Diane volunteered for Rebuilding Together, a non-profit organization that provides critical repairs and renovations for low-income homeowners across the United States, using her Akoya annual volunteer hours. This entry was posted in Front Page, News and tagged akoya on October 31, 2013 by Akoya. Akoya director of media Robert Matzen recently directed six local actors, nine extras, and a crew of 10 through a week of video shoots at locations throughout Pittsburgh. Akoya managed all production aspects for two courses of training and development videos for Development Dimensions International, a worldwide leader in talent development and management based out of Pittsburgh. Learn more about our video development and other core competencies. This entry was posted in Front Page, News and tagged akoya on October 15, 2013 by Akoya. Government Speak: Under GSA Contract GS-07F-062AA, Akoya was awarded a full suite of special item numbers (SINs) covered by the Advertising & Integrated Marketing Solutions (AIMS) Schedule for services, including public relations, commercial art and graphic design, video/film production, web based marketing, and conference, events, and tradeshow planning. Plain Speak: Federal customers can tap Akoya’s expertise in public relations, commercial art and graphic design, video/film production, web based marketing, and conference, events, and tradeshow planning through a new contracting vehicle. Learn more about Akoya contracting. This entry was posted in Front Page, News and tagged akoya on October 14, 2013 by Akoya. Making commercial buildings less energy intensive will deliver savings to American businesses as well as reduce carbon emissions. It will also create jobs for American workers with the right skills and credentials. But what are the “right” credentials? Today, there are no consistent, industry-recognized definitions of quality for training and professional certifications. 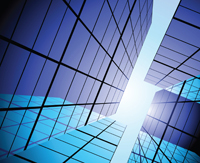 Akoya is excited to be supporting a new initiative being launched by the U.S. Department of Energy to address this issue: the Better Buildings Workforce Guidelines. Learn more at www.buildings.energy.gov/workforce. This entry was posted in Front Page, News and tagged akoya on October 11, 2013 by Akoya. 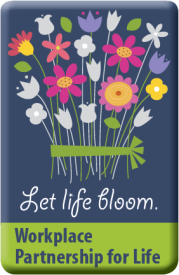 Akoya will continue to work with the great team at the U.S. Department of Health and Human Services’ Division of Transplantation to increase the number of designated organ, eye, and tissue donors nationally. In September, we were awarded a 5-year contract to provide communications, program support, and stakeholder engagement services to the Health Resources and Services Administration’s Workplace Partnership for Life initiative, a program we’ve been supporting since its inception in 2001. Learn more about our work with HHS. This entry was posted in Front Page, News and tagged akoya on October 4, 2013 by Akoya. 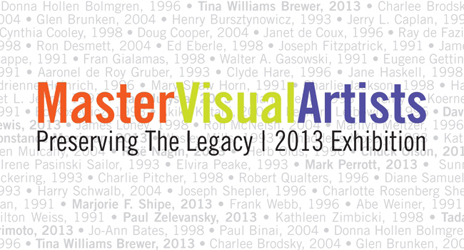 Akoya is sponsoring Master Visual Artists, Preserving The Legacy 2013 Exhibition on display at the Pittsburgh Center for the Arts through November 3rd. The exhibit is intended to draw awareness to the wealth of creative and talented visual artists in the Western Pennsylvania region. This year’s exhibit honors 10 local artists. This entry was posted in Front Page, News and tagged Pittsburgh on October 3, 2013 by Akoya.